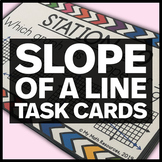 Assess your students' knowledge of slope with this Slope Test. 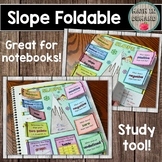 Students need to be able to identify the four types of slope and find slope (rate of change) from a graph, table, equation and between two ordered pairs. 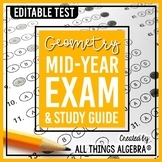 This test provides students a chance to work with slopes, linear equations, graphing, and word problem applications all in one assessment. 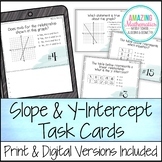 Students must explain what different pieces of the equations represent, and be able to convert between equations, word problems, and graphs. 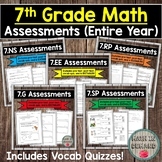 20 question assessment that includes questions on identifying slop from a graph as well as using the formula. 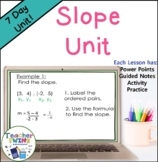 Students have to take steps and answer specific questions regarding slope, as well as write an equation. Editable! 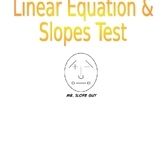 Full test on slopes, linear equations, slope-intercept form, and plotting points. Mostly multiple choice with some open ended and graphing. Assessment. Students find slope from points and lines. Graph lines with given point and slope. 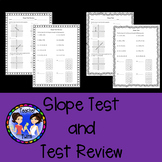 test over using slope, finding slope, and writing equations. 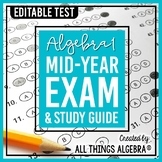 In this test they will write equations based off of graphs, tables, and word problems. 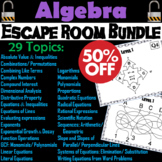 Algebra Escape Room Math Bundle: Polynomials, Distributive Property, Slope, etc.